4th, revised and expanded edition of 2017. 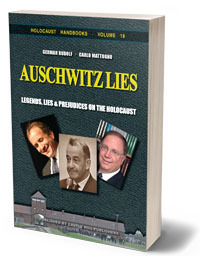 Keren, McCarthy and Mazal found the “Holes of Death,” saying they proved the existence of the Auschwitz gas chambers. But no, they twisted evidence to support their case and suppressed the facts. 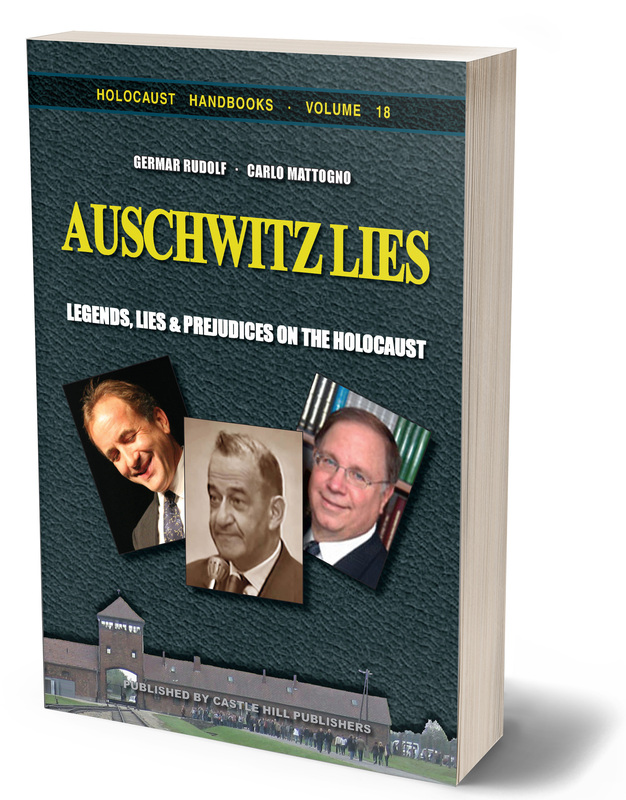 These and many other untruths about Auschwitz are exposed in this book for what they are: political lies created to ostracize dissident historians and keep the Western world in Holocaust servitude. 4th, revised and expanded edition, 420 pages. Format: pb, 6"×9", 90 illustrations, index. For prices please see retail outlets. In case you decide to download a free PDF file of this book instead of purchasing a printed copy, please consider supporting the author for his efforts and for the injustices he has suffered (he was sentenced to a total of 44 months imprisonment and a fine of €21,000 (some $28,000) for his revisionist publications) by making a donation. Details can be found on his website. Note: Books published by Castle Hill Publishers should be available anywhere books are sold – except for those companies boycotting us, like Amazon and Barnes & Noble. Search other online stores using the book-price search-engine links provided below, or when searching other stores use the ISBN number provided above. Also ask your local book store to order it for you. They should be able to get it for you. Buy at the source from the publishers CODOH/Castle Hill Publishers. FindBookPrices.com: Pick shipping destination and payment currency on their webpage. BookFinder4U.com: Good only for shipping addresses in the U.S. If you decide to download this book's free PDF or Kindle file instead of purchasing it, please consider supporting the publishers with a donation for their generosity. Electronic files of some (but not all) of the volumes of the Holocaust Handbooks have been released to the public domain for educational purposes only. Where this is the case, the files can be downloaded above. They may be copied and distributed by third parties free of charge only. No commercial use by third parties is permitted. If copied and distributed, no changes to the book are permitted without the prior written consent of the book's author(s)/editor(s).